How much cash is that? How many coins are there? Write a wrong answer for both questions. Write your best guess for both questions. Here's the plan. Release a single piece of information, then ask them to figure out possible solutions. Then release the next piece of information. Ask them to figure out possible solutions. This may involve a lot of guessing and checking. If so, you should feel free to step in and show them how mathematicians solve similar problems quickly, with no guess-and-checking at all. Fact #1: The cash is worth $62.00. Fact #2: There are 1,400 coins. Many coins of each type are there? How much money just got counted? What is the surface area of the coins? How deep is the pile of coins? Why are they sifting coins? 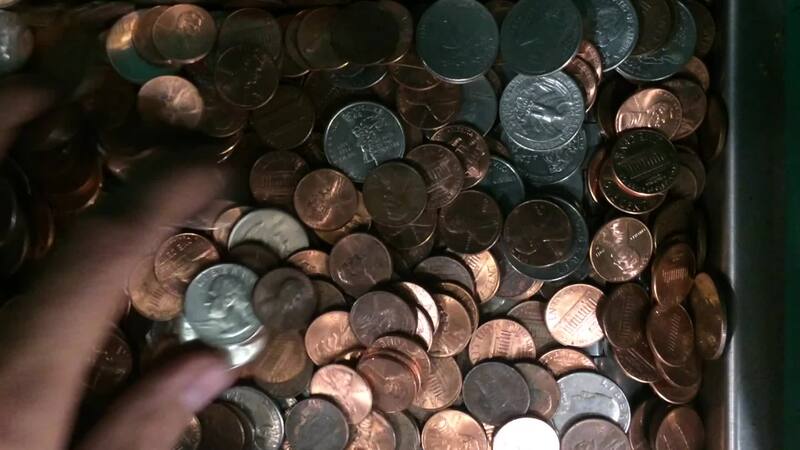 why are there so many pennies? What was the value of the coins? How much money did the Coin Star machine eat? How many coins per handful? How much $ is that? How big is the container and how many different types are contained? How much cash is there? How much money do I have!? How high can you stack the pennies? what is the ratio of pennies to silver? did the pennies fit through the holes? did the dimes? How many of each coin is there? How much money is in the machine? How much $ in all? How does it separate the coins into the right spot? who saved that much change! What is the total dollar amount from all of those coins? How much money is there in total? how many coins were silver as opposed to pennies? how much money is that total? Was this made with sheets of stamped out quarter sheets from the US Mint? What's the value of these coins? Why are there just quarters and pennies? How much money is there in the picture? How much change was that all together ? How many foreign coins did he end up having? How many different bacteria on all those coins? How much money was there? What is being used to place the coins into, and why? What is the object underneath all the coins? How do they count all the money?